Facebook has confirmed it has hired the former leader of the UK’s former third largest political party — Nick Clegg of the middle ground Liberal Democrats — to head up global policy and comms. The news was reported earlier by the Financial Times. Clegg is also a former UK deputy prime minister, after the Lib Dems entered government in the 2015 coalition with the Conservative party. Facebook confirmed to TechCrunch that Clegg’s title will be VP, global affairs and communications, and that he starts on Monday — and will be moving with his family to California in the New Year. Its prior global policy and communications chief, Elliot Schrage, who has been in post for a decade is staying on as an advisor, according to Facebook, and in a post announcing Clegg’s hire COO Sheryl Sandberg thanked Schrage for his “leadership, tenacity, and wise counsel ‑- in good times and bad”. Facebook also told us that Sandberg and founder Mark Zuckerberg were both deeply involved in the hiring process, beginning discussions with Clegg over the summer — as fallout from the Cambridge Analytica data misuse scandal continued to rain down — and emphasizing they have already spent a lot of time with him. The company also made a point of noting that Clegg is the most senior European politician to ever take up a senior executive leadership role in Silicon Valley. The hire certainly looks like big tech waking up to the fact it needs a far better relationship with European lawmakers. “Facebook, WhatsApp, Messenger, Oculus and Instagram are at the heart of so many people’s everyday lives – but also at the heart of some of the most complex and difficult questions we face as a society: the privacy of the individual; the integrity of our democratic process; the tensions between local cultures and the global internet; the balance between free speech and prohibited content; the power and concerns around artificial intelligence; and the wellbeing of our children,” he adds. In her note about Clegg’s hire, Sandberg lauds Clegg as “a thoughtful and gifted leader who… understands deeply the responsibilities we have to people who use our service around the world” — before also discussing the big challenges ahead. “Our company is on a critical journey. The challenges we face are serious and clear and now more than ever we need new perspectives to help us though this time of change,” she writes. “The opportunities are clear too. Every day people use our apps to connect with family and friends and make a difference in their communities. If we can honor the trust they put in us and live up to our responsibilities, we can help more people use technology to do good. One former Facebook policy staffer we spoke to for an insider perspective on Clegg’s hire, couched it as a sign Facebook is finally taking Europe seriously — i.e. as a regulatory force with the ability to bring big tech to rule. In Europe, the region’s new data protection framework, GDPR, which came into force at the end of May, has put privacy and security at the top of the tech agenda. And more regulations are coming — with the EU’s data protection supervisor warning today that GDPR is not enough. “The Facebook/Cambridge Analytica revelations are still under investigation in Europe and America, but they are only the tip of the iceberg, a sign of a much wider problem and a symptom of many more problems still unnoticed,” writes Giovanni Buttarelli in a blog entitled: The urgent case for a new ePrivacy law. Reshaping regional rules to account for and rebalance monopolistic platform power is where EU lawmakers are increasingly turning their attention. It looks like Facebook has finally caught on that they’re serious. “They didn’t take it seriously and they’re catching up now. I think it also just sends a strong signal that they’re not a U.S. centric company,” the former Facebooker added of the company’s attitude to EU policy, dating their dawning realization that a new approach was needed to around 2016. That was also, of course, the year that domestic election interference came home to roost for Zuckerberg, after Kremlin meddling in the US presidential elections. And after his famous failure to judge that detail important. 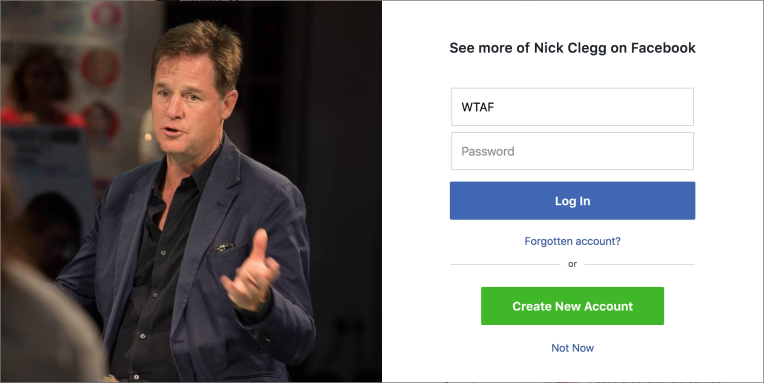 So no more ‘pretty crazy ideas’ from Zuckerberg where politics is concerned — Nick Clegg instead. For Brits, though, this actually is a pretty crazy idea, given Clegg is the awkwardly familiar face of middle ground, middler performance politics. And, more importantly, the sacrificial lamb of political compromise, after his party got punished for its turn in coalition government with David Cameron’s Brexit triggering Conservatives. Our ex-Facebooker source said they’d heard rumors linking the former Labour MP, David Miliband, and the Conservatives’ former chancellor, George Osborne, to the global policy position too. Whatever the truth of those rumors, in the event Facebook went with Clegg’s third way — which of course meshes perfectly with the company’s desire to be a platform for all views; be that conservative, liberal and Holocaust denier too. In Clegg it will have found a true believer that compromise can trump partisan tribalism. Though Facebook’s business will probably test the limits of even Clegg’s famous powers of accommodation. The current state of the Lib Dem political animal — a party with now just a handful of MPs (12) left in the UK parliament — does also hold a cautionary message for Facebook’s mission to be all things to all men. A target some less machiavellian types might judge ‘mission impossible’. Add to that, given Facebook’s now dire need to win back user trust — i.e. in the wake of a string of data scandals, such as the Cambridge Analytica affair (and indeed ongoing attempts by unknown forces to use its platform for voter manipulation) — Clegg is rather an odd choice of hire, given he’s the man who led a political party that fatally burnt the trust of its core supporters and convinced them to punish it with near political oblivion at the ballet box.